Everton host Fulham at Goodison on Saturday seeking to maintain perhaps the longest 100 per cent winning run against the same opponent at the same venue in English football. Everton have beaten Fulham in 20 straight league games at home now, dating back to 1961. They seek a 21st straight home league win against the same opponent against a backdrop of having the fewest Premier League defeats this season (one) at a time when Fulham have lost 10 of their 15 league games this term. 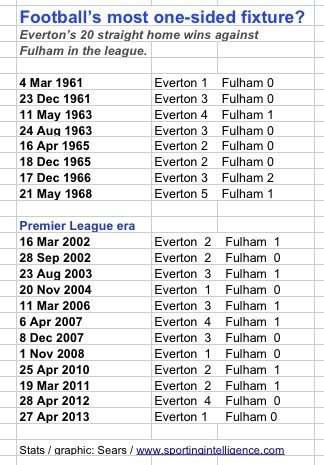 The last time Fulham even managed so much as a draw in the league at Everton was in a 0-0 draw in 1959. So since the 1959-60 season Fulham have visited Goodison 20 times in the league to be defeated each time, scoring 10 goals and conceding 51. If you know of a longer sequence of wins between teams, in any sport or any country but at the same ground in the same competition, do feel free to Tweet to @Sportingintel and we’ll add them here. This is Norwich’s seventh season of Premier League football and their ‘favourite’ opponents in that time in terms of most points per game won are this weekend’s opponents, Swansea. Norwich were in the Premier League for the first three seasons of the era, and then in 2004-05, and this is the third season of their current stay. Swansea visit Carrow Road on Sunday and our table below shows Norwich have gained more points per game from the Swans (2.5 points per game, or 10 points from four PL meetings) than from any of the other 38 clubs they have met in the Premier League. Indeed a 100 per cent record was only spoilt by the 2-2 draw at Carrow Road in April. The table also shows, by the way, that the toughest teams for Norwich to have gained points from are Wimbledon, Fulham and, after only one game, Hull. Norwich are in need of a win as in only one of their previous six Premier League seasons have they gained fewer points from the first 15 games than the 17 they currently have. And they were relegated that season. Here’s their sequence of points gained from the first 15 games in their previous six PL seasons: 30, 27, 21 (relegated), 12 (relegated), 19, and then 19 last season. Previous post THE ASHES: "Australia haven’t suddenly turned into a great team. They aren’t."